I hope that you are enjoying #CookoutWeek so far! I know that I'm pinning tons of recipes to try. I first started making corn on the cob in the slow cooker back in the summer of 2015. My guys love corn on the cob and I was looking for a way to do it that was less effort, but still delicious. All you do is clean the silk and husk off the corn, lay it on a square of foil, smear it with some butter and whatever herbs and seasonings you like. Wrap it up tightly, pop it in the slow cooker, and add about an inch of water. Cook it on high for 3 to 4 hours. This is my go to method now. Strawberry season is in full swing here in New England. It's one of my favorite times of the year. We hit the fields and bring home somewhere around 15 pounds of beautiful, juicy, sweet delicious berries. 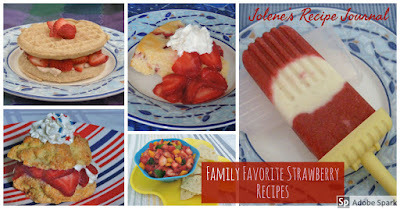 These are some of my family's favorite strawberry dishes. If you've never made homemade shortcake before, you're missing out. I love the vanilla added to the berry mixture. Either full size or as minis, these Berry Sour Cream muffins are always a hit! They're great for breakfast, or snacking. I make them all summer long, starting with strawberries in June, then blueberries in July, and winding up with blackberries in August. Another favorite is Citrus Berry Cake. It's like a shortcut version of strawberr shortcake. Great with fresh whipped cream or a dusting of powdered sugar. Happy Taste of Home Tuesday! I can't believe it's been 3 years since I was selected to be a Volunteer Field Editor for Taste of Home magazine! I started reading them way back in the 90s when my Gram subscribed, and I've got almost every issue back to the premiere. I've had two recipes published and have made more than 225 recipes from the magazines, cookbooks and their website. They're always winners with my family! It's National Iced Tea Day! I'm going to throw this out there and admit that push comes to shove, I'm definitely an iced coffee girl. When this event was announced, I decided I wanted to jump in and get out of my comfort zone a bit. There's one type of tea that I love, and it's the kind that's served at Chinese restaurants. The closest thing I've found to it is the Mandarin Spice from Celestial Seasonings. And what goes better with orange than blueberries? We've still got a ways to go before we can get them locally, but the ones at the grocery have been pretty good lately. June is National Fruits & Vegetables Month! The thing I most look forward to in June is strawberries. We're very lucky to live around lots of farms, and we make going to pick a family outing. Usually we bring home somewhere around 15 pounds. We leave some for snacking, a bunch gets turned into jam, and then I like to try a handful of new recipes. One of this year's picks is this Fresh Strawberry Salsa from Taste of Home. I made some very minor changes to the recipe. I'm not a fan of green bell pepper, so I used red and orange. I had beautiful heirloom cherry and grape tomatoes on hand, so I quartered them up and used those. I had serranos, so I used those instead of the Anaheim. Sadly, I am in the "cilantro tastes like soap" camp, so I used fresh parsley instead. The weather is heating up here, and I've been searching the Taste of Home site and my magazines for meals and snacks that are delicious and filling, but not heavy. This Inside Out Veggie Dip fit the bill nicely. I made some small changes. I used Greek yogurt cream cheese, omitted the green onions because I forgot to buy them, and garnished with some dried parsley. You definitely can change up the veggies any way you like, those mini bell peppers would be perfect for filling too. Bermuda onion would give the filling some beautiful color. The cream cheese mixture was also amazing on crackers and bagels. This is a super quick to put together recipe, but it looks so fancy. It would be great for showers, summer gatherings, or just sitting barefoot out on the patio with a good book. I'll definitely be making this one a lot, thank you so much to Judie T. for sharing her recipe! June is #DairyMonth and today is #NationalCheeseDay! What is better than hot melty cheese? Not a lot! So many of my favorite dishes are made with cheese, like nachos. We all love them, but the guys are pretty boring in that they just like the chips and cheese. I like toppings, and lots of them, and don't forget the sour cream on the side! Traditionally I see nachos with refried beans, and I'm not particularly a fan. I ran across this recipe from Taste of Home on Pinterest, and loved that it used black beans instead. I used cherry tomatoes instead of the canned, it was what I had on hand. I seeded and sliced the jalapenos per the recipe, but they weren't spicy enough for me that way. Next time I'll definitely just slice them. The rest of the toppings were perfect. Crunchy chips, cool tomatoes, a little heat from the peppers, plus the protein-packed beans. Thank you so much to Cynthia N. for her awesome recipe!